Skyline view of Cincinnati, Ohio. Greene Line Wharf lies at the foot of Sycamore Street at the mouth of the Licking River in Cincinnati, Ohio. This photograph was taken from the Kentucky side of the Ohio River. In 1788, Israel Ludlow, Matthias Denman, and Robert Patterson purchased eight hundred acres from John Cleves Symmes along the Ohio River at the Licking River's mouth. Symmes had purchased two million acres of land from the Confederation Congress in 1787 and now hoped to become rich by selling parts of the Symmes Purchase to others. Denman provided the necessary funds; Patterson found settlers; and Ludlow surveyed the land to make sales and also establish a town. By early January 1789, Ludlow had platted the town, dividing it into two types of lots. Near the town's center, lots were one-half acre. Outlying lots were four acres. Ludlow, Denman, and Patterson provided the first thirty settlers with two free lots, one of each type. The three men named the town Losantiville. The name was a convoluted contraction of the idea that this was a "city across from the mouth of the Licking River." The town grew slowly at first. One month after the settlement was established only three log cabins existed in Losantiville. On the outlying lots, settlers had constructed twenty cabins and one frame house. Eleven families and two dozen single men lived on the land. In August 1789, the village began to grow more quickly. In that month, Josiah Harmar authorized the construction of Fort Washington to protect settlers in both the Symmes Purchase and the Miami Purchase, as well as in northern Kentucky. The fort was located just west of Denman's, Ludlow's, and Patterson's eight hundred acres of land. Harmar made Fort Washington his headquarters upon its completion in December of 1787. Usually three hundred soldiers were stationed at the fort, increasing Losantiville's population to nearly five hundred people. In 1790, the governor of the Northwest Territory, Arthur St. Clair, proceeded to establish Hamilton County and made Losantiville the county seat. St. Clair disliked the name Losantiville and changed the town's name to Cincinnati. The town's name is recognition of the Roman citizen soldier Cincinnatus. It is also an acknowledgment of the Society of Cincinnati. General St. Clair was a member of this association of former officers of the Revolutionary War. An additional 250 families arrived later that year, swelling the town's population to nearly seven hundred people. Law and order remained absent from Cincinnati during its early years. The settlers organized a court and hired a sheriff, but the soldiers routinely had to establish martial law in the community. This became especially common as tensions increased with local American Indians, especially the Shawnee tribe. Contributing to the lawlessness, many residents distilled whiskey from their corn crops and sold it to the soldiers. During 1790 and 1791, thousands of militiamen from Kentucky and Pennsylvania flooded Cincinnati as Harmar and St. Clair planned expeditions against the American Indians. St. Clair faced such a difficult time maintaining control of his men in the town, with its three taverns, that he moved his men to nearby Ludlow's Station. After St. Clair's Defeat at the hands of the Indians in 1791 many settlers fled Cincinnati, fearing that the natives would descend upon them. Despite the lack of order and the various safety concerns, hundreds of settlers continued to come to the town. They believed that they could make their fortunes by providing the soldiers and people traveling down the Ohio River with supplies. By the summer of 1792, there were thirty warehouses Cincinnati to meet these needs. With the success of Anthony Wayne against the American Indians at the Battle of Fallen Timbers in 1794, more settlers arrived in the community, including a French pastry chef and a hairdresser. By early 1795, a spinning wheel manufacturer, a brewer, a chair manufacturer, and a butcher all had opened up businesses. In 1803, the year that the United States Army abandoned Fort Washington, the city had roughly one thousand civilian residents. It continued to grow, reaching nearly ten thousand people by 1820. Cincinnati had emerged as a major city, primarily due to its strategic location on the Ohio River. During the nineteenth century, Cincinnati continued to grow. 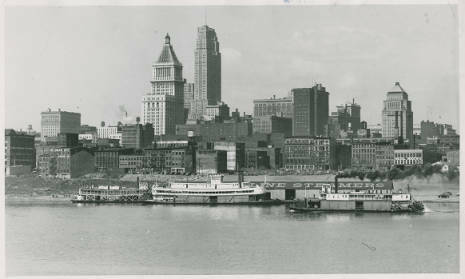 The Ohio River provided Cincinnati residents with numerous business opportunities. Hotels, restaurants, and taverns quickly opened to meet the needs of settlers traveling westward on the Ohio River. Steamboats were manufactured and repaired in the city. Farmers brought their crops to the city to send down the Ohio and Mississippi Rivers to New Orleans, Louisiana, one of Ohio's major markets. The Miami and Erie Canal made the trip from western Ohio to Cincinnati much easier and less expensive for local farmers. In the early 1800s, Cincinnati developed into an important meatpacking center. Farmers brought their livestock to the city, where it was slaughtered, processed, and sold to western settlers or shipped to various markets. Cincinnati was becoming the pork-processing center of the United States. Because of Cincinnati's association with meatpacking, the city became known as the "Porkopolis" of the United States. Cincinnati also played an important role in the intellectual and cultural development of Ohio during the first half of the nineteenth century. In 1819, Daniel Drake established the Medical College of Ohio, hoping to improve medical care on the frontier. Numerous literary figures, including Harriet Beecher Stowe, the author of Uncle Tom's Cabin, lived in Cincinnati for at least part of their lives. Beginning in the 1830s, ethnic Germans began to settle in Cincinnati. German and Irish immigrants mixed with Americans from both North and South to create a very diverse and worldly population. Some residents opposed the activities of other people in the city and actively campaigned to reform the community. The temperance movement targeted the Germans and the Irish, because they believed these groups were heavy drinkers. Ohio abolitionists concentrated their efforts in Cincinnati. Because it was located directly across the Ohio River from Kentucky, a slaveholding state, Cincinnati was an ideal site to publish newspapers and anti-slavery tracts to send to the South. This location also meant that many fugitive slaves travelled across the Ohio River and through the city toward potential freedom in the North. Not all white Ohioans supported the abolitionists. Many of these people feared that, if slavery ended, they would face competition from the freed African Americans. Race riots sometimes occurred, especially if whites feared that African Americans were gaining too much power or were infringing upon white opportunities. One such riot occurred in Cincinnati in 1829, because Irish immigrants disliked competition from the African-American community. During the Civil War, most residents of Cincinnati supported the United States, but a sizable number of people went south to fight for the Confederacy. Cincinnati served as a major recruiting and organization center for the United States military during the Civil War. The city's businesses thrived, as they provided supplies for the soldiers and housing for both the soldiers and their families. Various charity organizations also arrived in the city to help soldiers and their families, including the United States Sanitary Commission and the United States Christian Commission. By 1890, Cincinnati had become an important industrial, political, literary, and educational center in both Ohio and the United States. Cincinnati was the largest city in Ohio, with almost 300,000 people. Cincinnati had the densest population of any city in the United States, with an average of 37,143 people per square mile. More than fifteen railroads connected Cincinnati to other parts of the United States. The major industry in Cincinnati was iron production, followed closely by meatpacking, cloth production, and woodworking. Cincinnati's industries employed 103,325 people in 1887, and produced more than 200 million dollars in goods. Roughly 130 newspapers and magazines met the literary needs of the people. The public library had a collection of more than eighty thousand books. Cincinnati had an art museum and art academy, as well as an opera house and the Music Hall and Exposition Building. The University of Cincinnati provided residents with access to a college education. The city contained more than two hundred churches. It also had five hospitals. Cincinnati played a major role in Ohio government as well. By the end of the 1880s, the city had provided Ohio with thirteen governors, including Othniel Looker, Ethan Allen Brown, Salmon Chase, William Dennison, John Brough, Charles Anderson, Jacob Cox, Rutherford Hayes, Edward Noyes, Richard Bishop, George Hoadley, Thomas Young, and Joseph Foraker. During the twentieth century, Cincinnati has experienced continued growth both culturally and economically. The city's population has remained relatively constant since the 1880s with its population in 2000 at 365,000 people. The city encompasses just seventy-seven square miles of land. That does not mean that the region has not experienced a population explosion since the late 1800s. While only 365,000 people reside within the city's borders, more than 1.8 million people live in surrounding communities, providing businesses with a readily available supply of workers. Many major corporations have their national or regional headquarters in Cincinnati. In 2015, these included Procter & Gamble, Kroger, Cinergy, Macy’s Inc., E. W. Scripps Company, Totes Isotoner, and American Financial Group. Residents enjoy diverse employment opportunities. This diversity has helped Cincinnati residents to weather economic downturns comparatively easily, as no single business employs more than three percent of the city's workforce. When hard times have hit the community, local residents have persevered. During the Great Depression, many people found employment through various government programs, including the Works Progress Administration and the Public Works Administration. It was also during the Great Depression when the Carew Tower, Cincinnati's tallest building, was built. In 2015 Cincinnati remained the cultural center of southwestern Ohio, northern Kentucky, and southern Indiana. The city boasted two major professional sports franchises, the Cincinnati Reds and the Cincinnati Bengals. Numerous theaters operated in the city, including the Aronoff Center for the Arts -- home of the Cincinnati Ballet and the Cincinnati Opera-- the Emery Theater, the Taft Theater, the Showboat Majestic, the Playhouse in the Park, the University of Cincinnati College Conservatory of Music, and Music Hall. More than one hundred art galleries existed in the city and the surrounding area. The most prominent ones are the Cincinnati Art Museum, the Contemporary Arts Center, and the Taft Museum. The Cincinnati Zoo and Botanical Garden is known for its successful breeding programs. Despite this cultural and economic growth, not all residents are able to enjoy the benefits of living within Cincinnati's borders. Within the city's boundaries reside people of all socio-economic backgrounds. Some residents enjoy life in upscale communities, but many residents live in lower-income areas. Many downtown businesses moved to the suburbs beginning in the 1950s, and wealthier residents went with them. Residents who could not afford to move with the companies experienced a shortage of jobs. This made it difficult for some people to experience the city's numerous benefits. In the late 1990s and early 2000s, Cincinnati officials made dramatic efforts to revitalize the downtown area, providing local residents with additional opportunities. Aaron, Daniel. Cincinnati, Queen City of the West, 1819-1838. Columbus: The Ohio State University Press, 1992. Carter, Alfred George Washington. The Old Court House: Reminiscences and Anecdotes of the Courts and Bar of Cincinnati. Cincinnati, OH: P.G. Thomson, 1880. Farrell, Richard Terrence. Cincinnati in the Early Jackson Era, 1816-1834: An Economic and Political Study. Bloomington: Indiana University Press, 1967. Gale, Oliver M. They Helped Shape Our City. Cincinnati, OH: Cincinnati Oral History Foundation, 1992. Glazer, Walter. Cincinnati in 1840: The Social and Functional Organization of an Urban Community During the Pre-Civil War Period. Columbus: The Ohio State University Press, 1999. Leonard, Lewis Alexander, ed. Greater Cincinnati and Its People. New York, NY: Lewis Historical Publishing Co., Inc., n.d.
Lesick, Lawrence Thomas. The Lane Rebels: Evangelicalism and Antislavery in Antebellum America. Metuchen, N.J.: Scarecrow Press, 1980. Marcus, Alan I. Plague of Strangers: Social Groups and the Origins of City Services in Cincinnati, 1819-1870. Columbus: The Ohio State University Press, 1991. Miller, Zane L. Visions of Place: The City, Neighborhoods, Suburbs, and Cincinnati's Clifton, 1850-2000. Columbus, OH: The Ohio State University Press, 2001. Painter, Sue Ann. Architecture in Cincinnati: An Illustrated History of Designing and Building an American City. Athens: Ohio University Press, 2006.